You’ve launched your customer reference program, and created several reference cases – now how do you measure the results? Just like all your other initiatives, you need to be able to measure the return on your marketing investment. You can tell a lot from the reactions of your customers when they’re asked to participate in a customer reference program. Keep records on (1) the amount of accepted vs refused requests to participate; (2) the throughput time of a reference project (this indicates a willingness to work together); and (3) the scope of tools that your customers are willing to take part in (reference case, speaking opportunities, demonstrations, etc. ), and file this information with your customer reference program statistics. Try setting targets per region for your customer reference program strategy. Set targets for customer references in high-priority industries, and monitor the impact on awareness and sales numbers in your customer reference program analytics. The information you’ve gathered on customers and integrated in your CRP database can help sales as well as product development, marketing, and customer service. Access statistics from this database for insight into how your organization is using this intelligence in their daily activities. There are lots of other ways to measure the success of your CRP program, including developing a participation index to calculate the contributions of your customers towards sales wins, and monitoring how a reference case moves a customer upwards on the loyalty ladder. Want to know more? 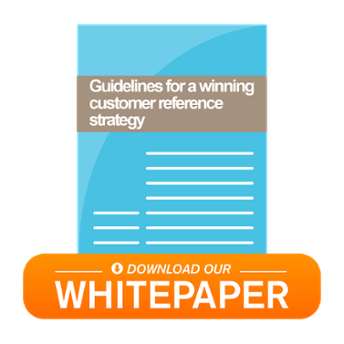 We’ve created a whitepaper, “Guidelines for a winning customer reference strategy,” that includes everything you need to know to launch and manage a successful customer reference program. This whitepaper offers step-by-step information on how to set objectives for your program, how to launch it with maximum impact, how to keep the momentum going after you’ve launched, and how to measure the results. You can download it here.